A p-value is the probability of the observed, or more extreme, data, under the assumption that the null-hypothesis is true. The goal of this blog post is to understand what this means, and perhaps more importantly, what this doesn’t mean. People often misunderstand p-values, but with a little help and some dedicated effort, we should be able explain these misconceptions. Below is my attempt, but if you prefer a more verbal explanation, I can recommend Greenland et al. (2016). First, we need to know what ‘the assumption that the null-hypothesis is true’ looks like. Although the null-hypothesis can be any value, here we will assume the null-hypothesis is specified as a difference of 0. When this model is visualized in text-books, or in power-analysis software such as g*power, you often see a graph like the one below, with t-values on the horizontal axis, and a critical t-value somewhere around 1.96. For a mean difference, the p-value is calculated based on the t-distribution (which is like a normal distribution, and the larger the sample size, the more similar the two become). 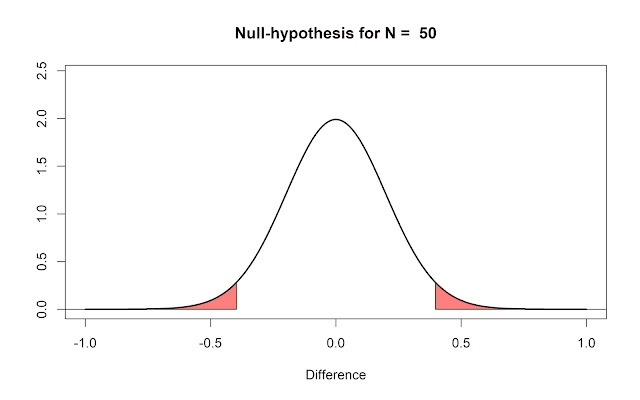 I will distinguish the null hypothesis (the mean difference in the population is exactly 0) from the null-model (a model of the data we should expect when we draw a sample when the null-hypothesis is true) in this post. I’ve recently realized that things become a lot clearer if you just plot these distributions as mean differences, because you will more often think about means, than about t-values. 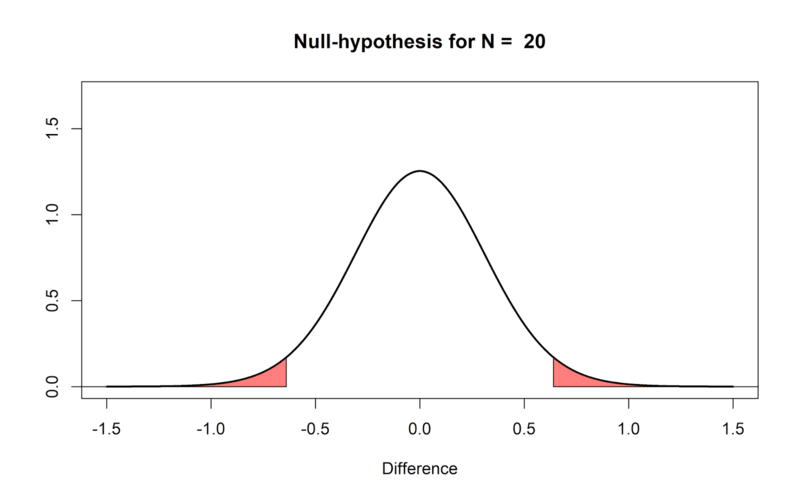 So below, you can see a null-model, assuming a standard deviation of 1, for a t-test comparing mean differences (because the SD = 1, you can also interpret the mean differences as a Cohen’s d effect size). 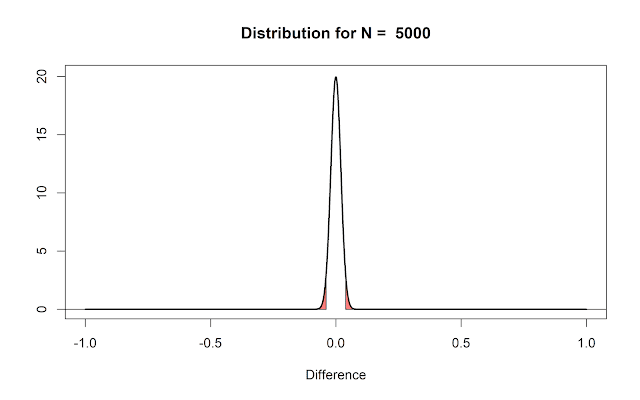 The first thing to notice is that we expect that the mean of the null-model is 0: The distribution is centered on 0. But even if the mean in the population is 0, that does not imply every sample will give a mean of exactly zero. 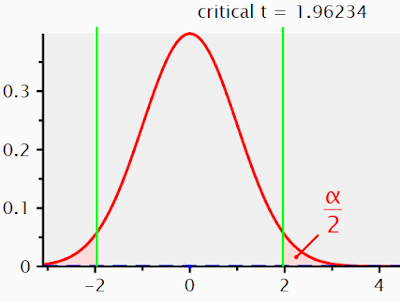 There is variation around the mean, as a function of the true standard deviation, and the sample size. One reason why I prefer to plot the null-model in raw scores instead of t-values is that you can see how the null-model changes, when the sample size increases. 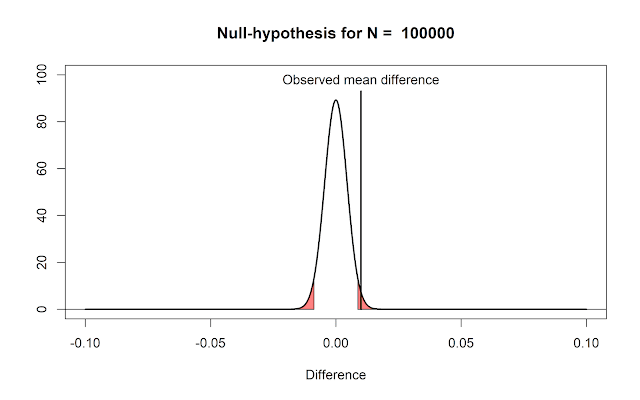 When we collect 5000 instead of 50 observations, we see the null-model is still centered on 0 – but in our null-model we now expect most values will fall very close around 0. 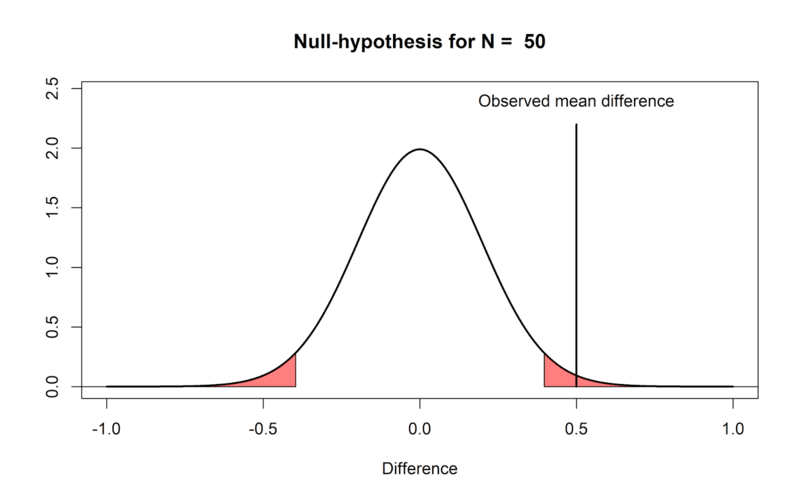 Due to the larger sample size, we should expect to observe mean differences in our sample closer to 0 compared to our null-model when we had only 50 observations. Both graphs have areas that are colored red. These areas represent 2.5% of the values in the left tail of the distribution, and 2.5% of the values in the right tail of the distribution. Together, they make up 5% of the most extreme mean differences we would expect to observe, given our number of observations, when the true mean difference is exactly 0 – representing the use of an alpha level of 5%. The vertical axis shows the density of the curves. Let’s assume that in the figure visualizing the null model for N = 50 (two figures up) we observe a mean difference of 0.5 in our data. This observation falls in the red area in the right tail of the distribution. This means that the observed mean difference is surprising, if we assume that the true mean difference is 0. If the true mean difference is 0, we should not expect such a extreme mean difference very often. If we calculate a p-value for this observation, we get the probability of observing a value more extreme (in either tail, when we do a two-tailed test) than 0.5. Take a look at the figure that shows the null-model when we have collected 5000 observations (one figure up), and imagine we would again observe a mean difference of 0.5. It should be clear that this same difference is even more surprising than it was when we collected 50 observations. 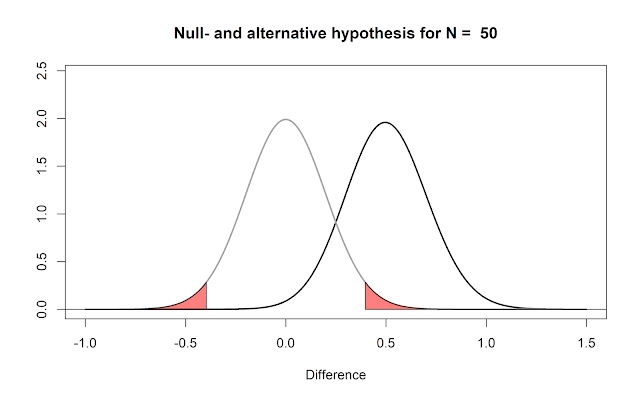 We are now almost ready to address common misconceptions about p-values, but before we can do this, we need to introduce a model of the data when the null is not true. When the mean difference is not exactly 0, the alternative hypothesis is true – but what does an alternative model look like? When we do a study, we rarely already know what the true mean difference is (if we already knew, why would we do the study?). But let’s assume there is an all-knowing entity. Following Paul Meehl, we will call this all-knowing entity Omniscient Jones. Before we collect our sample of 50 observations, Omniscient Jones already knows that the true mean difference in the population is 0.5. Again, we should expect some variation around this true mean difference in our small sample. 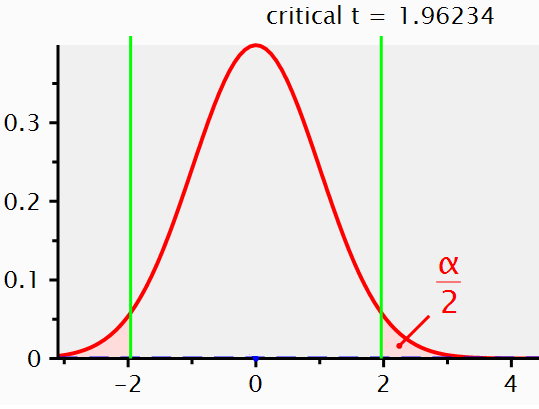 The figure below again shows the expected data pattern when the null-hypothesis is true (now indicated by a grey line) and it shows an alternative model, assuming a true mean difference of 0.5 exists in the population (indicated by a black line). But Omniscient Jones could have said the true difference was much larger. Let’s assume we do another study, but now before we collect our 50 observations, Omniscient Jones tells us that the true mean difference is 1.5. The null model does not change, but the alternative model now moves over to the right. Now, we are finally ready to address some common misconceptions about p-values. Before we look at misconceptions in some detail, I want to remind you of one fact that is easy to remember, and will enable you to recognize many misconceptions about p-values: p-values are a statement about the probability of data, not a statement about the probability of a theory. Whenever you see p-values interpreted as a probability of a theory or a hypothesis, you know something is not right. Now let’s take a look at why this is not right. 1) Why a non-significant p-value does not mean that the null-hypothesis is true. Let’s take a concrete example that will illustrate why a non-significant result does not mean that the null-hypothesis is true. In the figure below, Omniscient Jones tells us the true mean difference is again 0.5. We have observed a mean difference of 0.35. 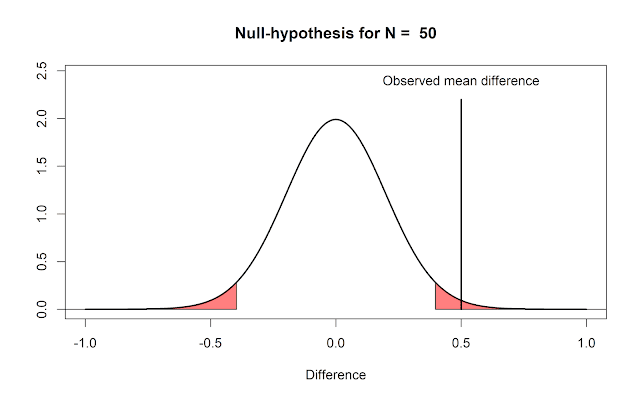 This value does not fall within the red area (and hence, the p-value is not smaller than our alpha level, or p > .05). Nevertheless, we see that observing a mean difference of 0.35 is much more likely under the alternative model, than under the null-model. All the p-value tells us is that this value is not extremely surprising, if we assume the null-hypothesis is true. A non-significant p-value does not mean the null-hypothesis true. It might be, but it is also possible that the data we have observed is more likely when the alternative hypothesis is true, than when the null-hypothesis is true (as in the figure above). 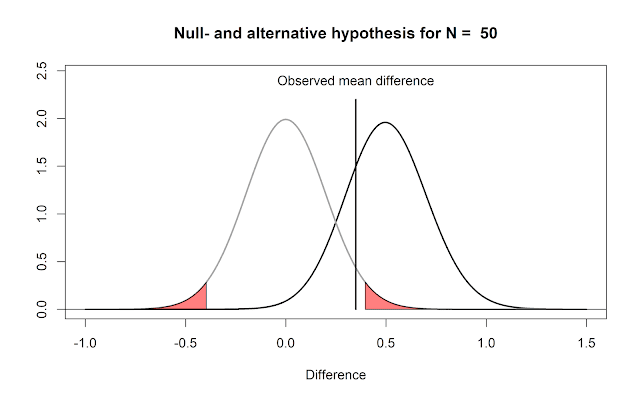 2) Why a significant p-value does not mean that the null-hypothesis is false. This command generates 50 random observations from a distribution with a mean of 0 and a standard deviation of 1. We run this command once, and we observe a mean difference of 0.5. 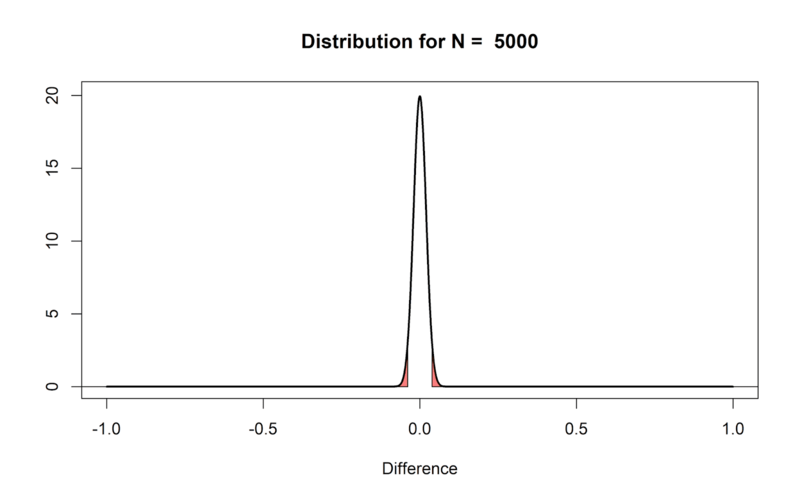 We can perform a one-sample t-test against 0, and this test tells us, with a p < .05, that the data we have observed is surprisingly extreme, assuming the random number generator in R functions as it should. Should we decide to reject the null-hypothesis that the random number generator in R works? That would be a bold move indeed! We know that the probability of observing surprising data, assuming the null hypothesis is true, has a maximum of 5% when our alpha is 0.05. What we can conclude, based on our data, is that we have observed an extreme outcome, that should be considered surprising. But such an outcome is not impossible when the null-hypothesis is true. And in this case, we really don’t even have an alternative hypothesis that can explain the data (beyond perhaps evil hackers taking over the website where you downloaded R). This misconception can be expressed in many forms. For example, one version states that the p-value is the probability that the data were generated by chance. Note that this is just a sneaky way to say: The p-value is the probability that the null hypothesis is true, and we observed an extreme p-value just due to random variation. As we explained above, we can observe extreme data when we are basically 100% certain that the null-hypothesis is true (the random number generator in R works as it should), and seeing extreme data once should not make you think the probability that the random number generator in R is working is less than 5%, or in other words, that the probability that the random number generator in R is broken is now more than 95%. Remember: P-values are a statement about the probability of data, not a statement about the probability of a theory or a hypothesis. 3) Why a significant p-value does not mean that a practically important effect has been discovered. 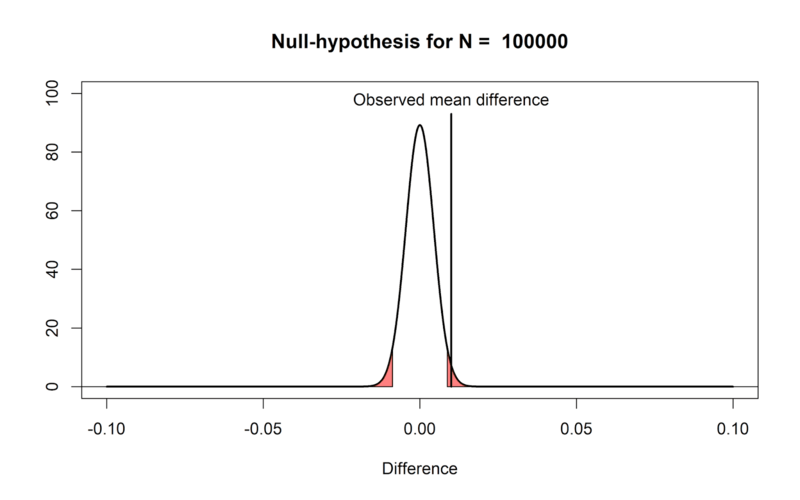 If we plot the null-model for a very large sample size (N = 100000) we see that even very small mean differences (here, a mean difference of 0.01) will be considered ‘surprising’. We have such a large sample size, that all means we observe should fall very close around 0, and even a difference of 0.01 is already considered surprising, due to our substantial level of accuracy because we collected so much data. 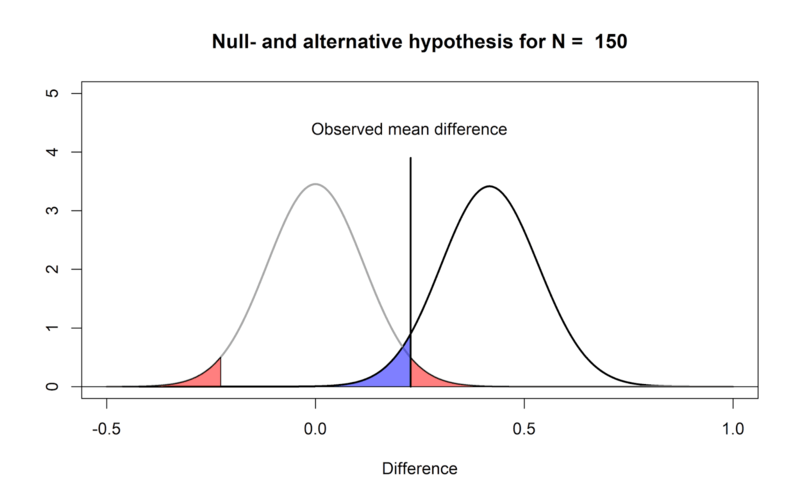 Note that nothing about the definition of a p-value changes: It still correctly indicates that, if the null-hypothesis is true, we have observed data that should be considered surprising. However, just because data is surprising, does not mean we need to care about it. It is mainly the verbal label ‘significant’ that causes confusion here – it is perhaps less confusing to think of a ‘significant’ effect as a ‘surprising’ effect (as long as the null-model is realistic - which is not automatically true). This example illustrates why you should always report and interpret effect sizes, with hypothesis tests. This is also why it is useful to complement a hypothesis test with an equivalence test, so that you can conclude the observed difference is surprisingly small if there is no difference, but the observed difference is also surprisingly closer to zero, assuming there exists any effect we consider meaningful (and thus, we can conclude the effect is equivalence to zero). 4) If you have observed a significant finding, the probability that you have made a Type 1 error (a false positive) is not 5%. If this is our reality, it means that 100% of the time that we observe a significant result, it is a false positive. Thus, 100% of our significant results are Type 1 errors. 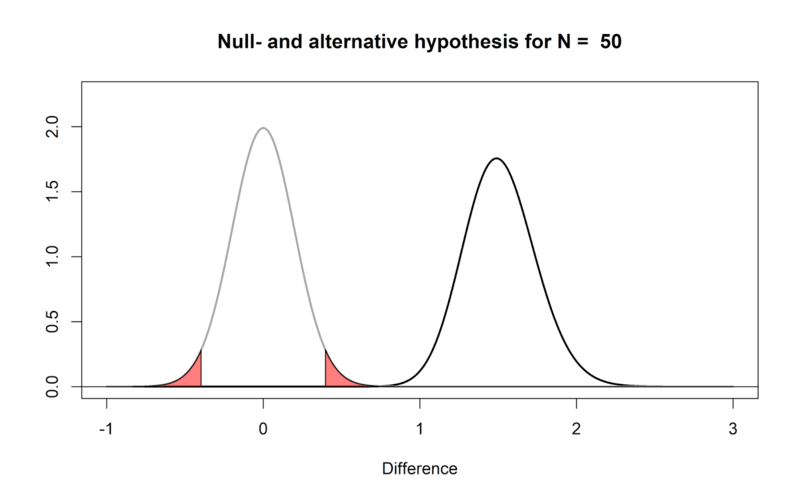 What the Type 1 error rate controls, is that from all studies we perform when the null is true, not more than 5% of our observed mean differences will fall in the red tail areas. But when they have fallen in the tail areas, they are always a Type 1 error. 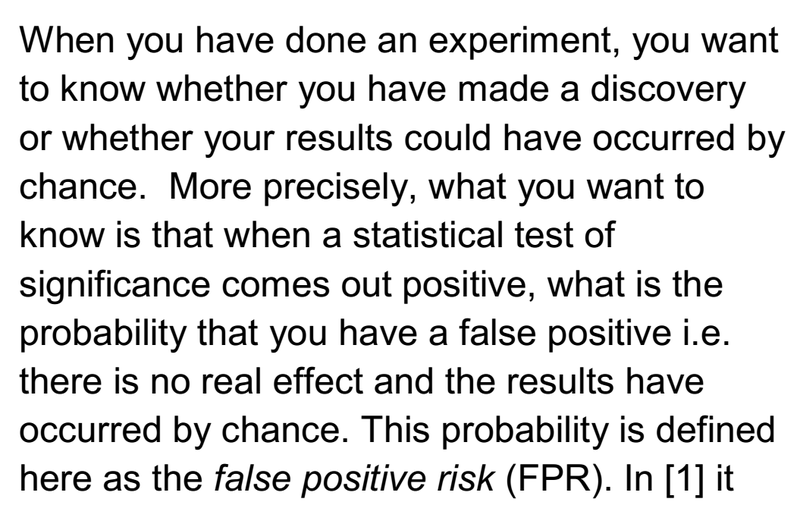 After observing a significant result, you can not say it has a 5% probability of being a false positive. But before you collect data, you can say you will not conclude there is an effect, when there is no effect, more than 5% of the time, in the long run. 5) One minus the p-value is not the probability of observing another significant result when the experiment is replicated. It is impossible to calculate the probability that an effect will replicate, based on the p-value, and as a consequence, the p-value can not inform us about the p-value we will observe in future studies. When we have observed a p-value of 0.05, it is not 95% certain the finding will replicate. 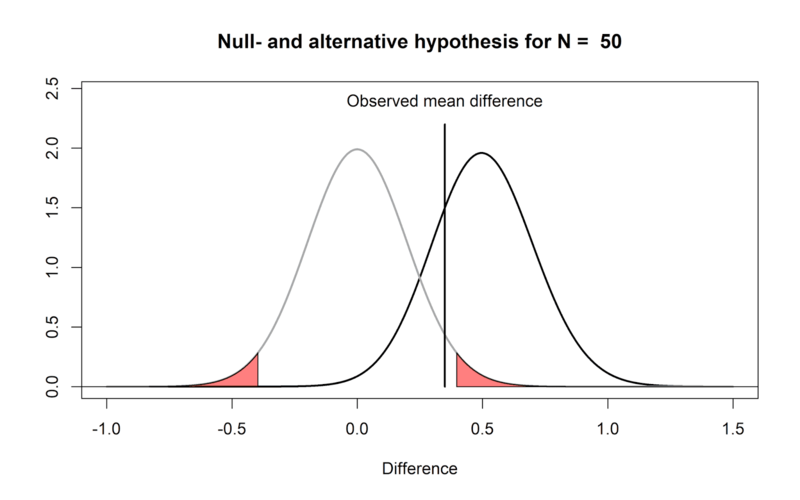 Only when we make additional assumptions (e.g., the assumption that the alternative effect is true, and the effect size that was observed in the original study is exactly correct) can we model the p-value distribution for future studies. It might be useful to visualize the one very specific situation when the p-value does provide the probability that future studies will provide a significant p-value (even though in practice, we will never know if we are in this very specific situation). In the figure below we have a null-model and alternative model for 150 observations. The observed mean difference falls exactly on the threshold for the significance level. This means the p-value is 0.05. In this specific situation, it is also 95 probable that we will observe a significant result in a replication study, assuming there is a true effect as specified by the alternative model. If this alternative model is true, 95% (1-p) of the observed means will fall on the right side of the observed mean in the original study (we have a statistical power of 95%), and only 5% of the observed means will fall in the blue area (which contains the Type 2 errors). This very specific situation is almost always not your reality. It is not true when any other alternative hypothesis is correct. And it is not true when the the null-hypothesis is true. In short, the p-value basically never, except for one very specific situation when the alternative hypothesis is true and of a very specific size you will never know you are in, gives the probability that a future study will once again yield a significant result. 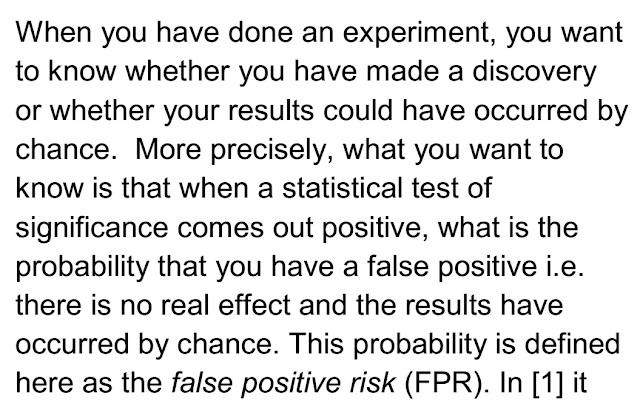 Probabilities are confusing, and the interpretation of a p-value is not intuitive. Grammar is also confusing, and not intuitive. But where we practice grammar in our education again and again and again until you get it, we don’t practice the interpretation of p-values again and again and again until you get it. Some repetition is probably needed. Explanations of what p-values mean are often verbal, and if there are figures, they use t-value distributions we are unfamiliar with. Instead of complaining that researchers don’t understand what p-values mean, I think we should try to explain common misconceptions multiple times, in multiple ways. This work is licensed under a Creative Commons Attribution-NonCommercial-ShareAlike 4.0 License. This article explores the statistical concept of science-wise false discovery rate (SWFDR). Some authors use SWFDR and its complement, positive predictive value, to argue that most (or, at least, many) published scientific results must be wrong unless most hypotheses are a priori true. I disagree. While SWFDR is valid statistically, the real cause of bad science is “Publish or Perish”. Is science broken? 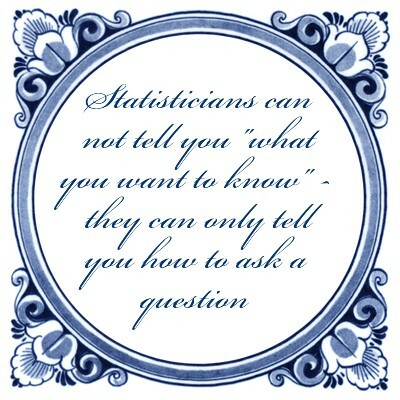 A lot of people seem to think so, including some esteemed statisticians. One line of reasoning uses the concepts of false discovery rate and its complement, positive predictive value, to argue that most (or, at least, many) published scientific results must be wrong unless most hypotheses are a priori true. The false discovery rate (FDR) is the probability that a significant p-value indicates a false positive, or equivalently, the proportion of significant p-values that correspond to results without a real effect. The complement, positive predictive value (\(PPV=1-FDR\)) is the probability that a significant p-value indicates a true positive, or equivalently, the proportion of significant p-values that correspond to results with real effects. I became interested in this topic after reading Felix Schönbrodt’s blog post, “What’s the probability that a significant p-value indicates a true effect?” and playing with his ShinyApp. Schönbrodt’s post led me to David Colquhoun’s paper, “An investigation of the false discovery rate and the misinterpretation of p-values” and blog posts by Daniel Lakens, “How can p = 0.05 lead to wrong conclusions 30% of the time with a 5% Type 1 error rate?” and Will Gervais, “Power Consequences”. The term science-wise false discovery rate (SWFDR) is from Leah Jager and Jeffrey Leek’s paper, “An estimate of the science-wise false discovery rate and application to the top medical literature”. Earlier work includes Sholom Wacholder et al’s 2004 paper “Assessing the Probability That a Positive Report is False: An Approach for Molecular Epidemiology Studies” and John Ioannidis’s 2005 paper, “Why most published research findings are false”. Being a programmer and not a statistician, I decided to write some R code to explore this topic on simulated data. for false instances, I use the same distribution as group0. The parameter d is the effect size, aka Cohen’s d.
I use the t-test to compare the means of the groups and produce a p-value assessing whether both groups come from the same distribution. The program does this thousands of times (drawing different random numbers each time, of course), collects the resulting p-values, and computes the FDR. The program repeats the procedure for a range of assumptions to determine the conditions under which most positive results are wrong. For true instances, we expect the difference in means to be approximately d and for false ones to be approximately 0, but due to the vagaries of random sampling, this may not be so. If the actual difference in means is far from the expected value, the t-test may get it wrong, declaring a false instance to be positive and a true one to be negative. The goal is to see how often we get the wrong answer across a range of assumptions. To reduce confusion, I will be obsessively consistent in my terminology. An instance is a single run of the simulation procedure. The terms positive and negative refer to the results of the t-test. A positive instance is one for which the t-test reports a significant p-value; a negative instance is the opposite. Obviously the distinction between positive and negative depends on the chosen significance level. true and false refer to the correct answers. A true instance is one where the treatment group (group1) is drawn from a distribution with \(mean=d\) (\(d>0\)). A false instance is the opposite: an instance where group1 is drawn from a distribution with \(mean=0\). empirical refers to results calculated from the simulated data, as opposed to theoretical which means results calculated using standard formulas. The simulation procedure with default parameters produces four graphs similar to the ones below.